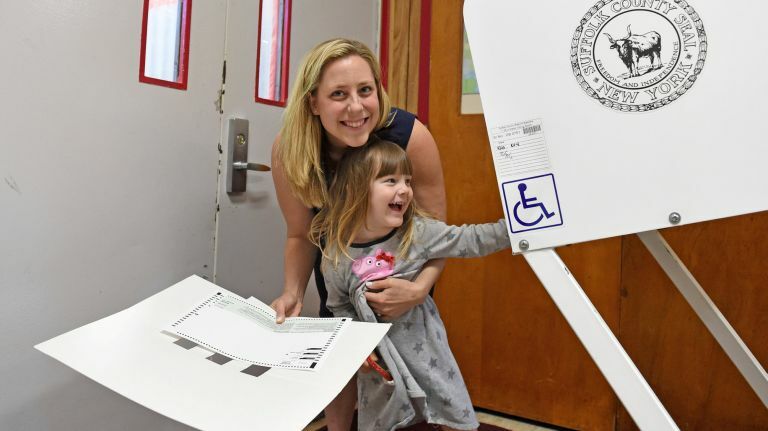 First time candidates Perry Gershon and Liuba Grechen Shirley defeated longtime party veterans for two Democratic Congressional nominations Tuesday night. With all precincts reporting, East Hampton businessman Perry Gershon had 36 percent of the vote to 30 percent for former Suffolk Legis. Kate Browning, who called Gershon late last night to congratulate him. Three other challengers had 34 percent of the vote combined. Gershon will face Rep. Lee Zeldin (R-Shirley) in November. Grechen Shirley beat DuWayne Gregory, presiding officer of the Suffolk County Legislature, by a margin of 58 percent to 42 percent in the 2nd Congressional District primary. Grechen Shirley, of Amityville, will face Rep. Peter King (R-Seaford). “Thank you for joining this movement — for knocking on doors, for making telephone calls, for texting voters to come out,” Grechen Shirley told cheering supporters Tuesday night. Also, in the 5th District, veteran Democratic incumbent Gregory Meeks, of St. Albans, Queens, beat two primary challengers. The district is located primarily in southeast Queens, but includes 60,000 voters in Nassau County. Gershon, 56, had campaigned as a progressive with business experience who could mount a well-funded campaign against Zeldin, the two-term Shirley Republican. Gershon switched his voter registration from Manhattan to his family’s second home in East Hampton last year to run for Congress. His campaign spent $2 million, four times more than Browning, the next biggest spender, including $1 million on television ads, according to his campaign. He loaned and contributed $1.3 million to his own campaign. Browning, 58 of Shirley, had touted her blue collar roots — she was Zeldin’s bus driver in elementary school, she said — plus 12 years on the Suffolk County legislature and union support in the crowded Democratic primary. The other First District candidates were former Suffolk Legis. Viloria-Fisher, former Brookhaven National Laboratory scientist Elaine DiMasi and David Pechefsky, a Bernie Sanders supporter in the 2016 presidential race who built his congressional campaign as an unapologetic progressive seeking to tap into young voters. In the Second District, Grechen Shirley, 37 of Amityville, and Gregory, 49 of Copiague, fought an increasingly bitter battle. Gregory said he had the list of accomplishments as a legislator to face King. Grechen Shirley noted Gregory’s loss to King in 2016 by 24 percentage points, and criticized the Suffolk County Democratic Party leadership. Suffolk police arrested one supporter of Grechen Shirley on Monday, Michael Hudnall, 31 of Lindenhurst, for refusing to leave Gregory’s campaign headquarters in Lindenhurst, according to Suffolk County police. The man was charged with trespassing and released at the First District with a desk appearance ticket. The Grechen Shirley campaign disavowed his actions and said he acted without the campaign’s knowledge. Both Zeldin and King easily won re-election in 2016. But Democrats are trying to tap into the energy in their base since Republican President Donald Trump’s election. One measure of Democratic enthusiasm could be turnout in the 1st District primary this year compared with 2016, when former Southampton Supervisor Anna Throne-Holst faced former Suffolk County Planning Commission Chairman David Calone. That race drew out 12,581 voters, or 9.26 percent of eligible Democrats, according to the Suffolk Board of Elections. Throne-Holst lost to Zeldin in the general election. In the 2nd District, Grechen Shirley’s campaign has raised $462,128, earlier this month. Gregory’s campaign has raised $132,129. Democrats will hold a unity rally on Thursday in Smithtown, near where Zeldin is hosting a campaign kickoff event with former Trump administration officials Sean Spicer and Sebastian Gorka. In the primary in the 5th Congressional District, Meeks beat NYPD Det. Carl Achille, of Elmont, and Mizan Choudhury, of Bellerose, an operations manager at Northwell Health.